Mill Valley girls basketball star Claire Kaifes has some unfinished business before heading to Marquette in the fall. SHAWNEE, Kan. — It certainly seems as if basketball comes naturally to Mill Valley girls basketball standout Claire Kaifes. After all, her family excels at the sport and she's the next one in line. Kaifes leads her team both in assists and rebounds and is one of the best players in the Kansas City metro. 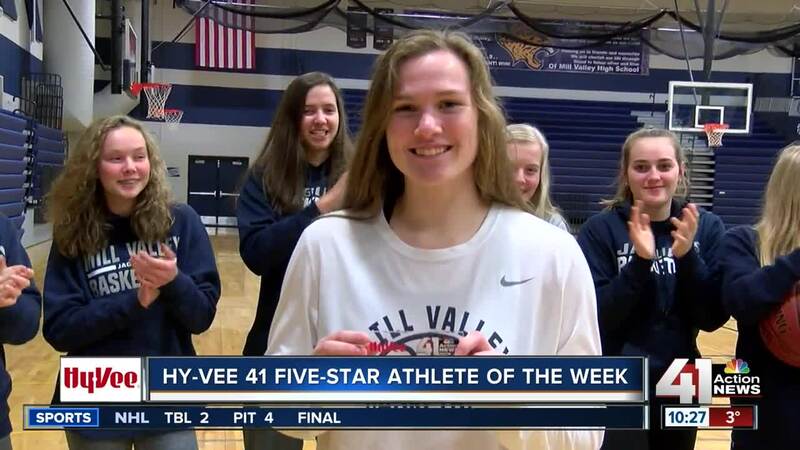 So, it really should not come as a surprise that she was named as the Hy-Vee 41 Five-Star Athlete of the Week. "I honestly just feel so honored that what I do on and off the court is impacting people everywhere. And, it just makes me feel like I'm just being the best person I can be on and off the court," Kaifes said of being the Athlete of the Week. "It makes me feel like what I'm doing is what I need to be doing." Mill Valley head coach Drew Walters knows how important Claire is to her team on and off the court. He noted that her presence and awareness within a particular game almost feels like having a coach out on the floor. "She'll find open teammates all the time. And then, she does just such a good job of handling pressure that every team's bringing us and setting us up and getting us into our offense," Mill Valley girls basketball head coach Drew Walters said. "And then, when we need a bucket, she knows it's time. And, she'll go find one of those too." Not only is Claire celebrated for her efforts on the court, she is beloved by her teammates off the court too. "Claire is like one of my very best friends on and off the court. She treats you like she's your best friend and, she's always there to help you. [She] will always like make you laugh [and] just put you in a good mood all the time," Jaguars sophomore guard Elle Zars said. "She's always like the hardest working person out there. And, she is always going like the extra mile to help anyone out who needs it. You can always count on her to do whatever you need. Like, if someone's struggling, she'll always pick you up and bring you back and like focus you back in the game." While Claire's teammates certainly appreciate all that she brings to the Jaguars team, Kaifes is equally as appreciative of how they support her. "My teammates, I wanna say are the best teammates that a girl can have. They are just so unselfish. They're so caring," Kaifes said. "They understand that, it's not all about them. It's not a 'me' sport. It's a 'we' sport. And, it's just, it's so nice to have teammates like that cause, it really just helps everyone play their best game." As for basketball running in the family, Claire's older brother Cooper Kaifes is a starter on the Loyola Chicago men's basketball team. Claire will also play division one women's college basketball at Marquette in the fall. "I'm incredibly blessed. I feel like Marquette is such a good school. It's the exact fit I was looking for academically [and] athletically," Kaifes said. "The coaches are great. The teammates that I met there are great. And, I'm just looking forward to it so much. And, I know I'm not done here right now. But, next year is gonna be great. I'm looking forward to it."